St. Ambrose parish was created in 1966 to serve the growing areas of Fairfax and Annandale, as well as the recently established Fairfax Hospital. Our first Masses were held in the auditorium of a local public middle school, then in 1968, a church with adjoining classrooms was built on site. In 1977 a new church was dedicated, which serves as our current church today. As the population continued to grow, in 1994 the original church with classrooms was turned into a parish school with a gym. In 2001, a parish center was opened to provide church offices, meeting rooms and a parish hall. In 2009, the parish faced some difficult decisions concerning the upkeep of the current church, as it was in need of a major renovation project. After holding several town hall meetings with parishioners and parish committees, the decision was made to move forward with a comprehensive study to evaluate the needs of the parish both today, and in the future. With the help of the Diocese of Arlington, architects, and parish committees, a master plan was agreed upon. 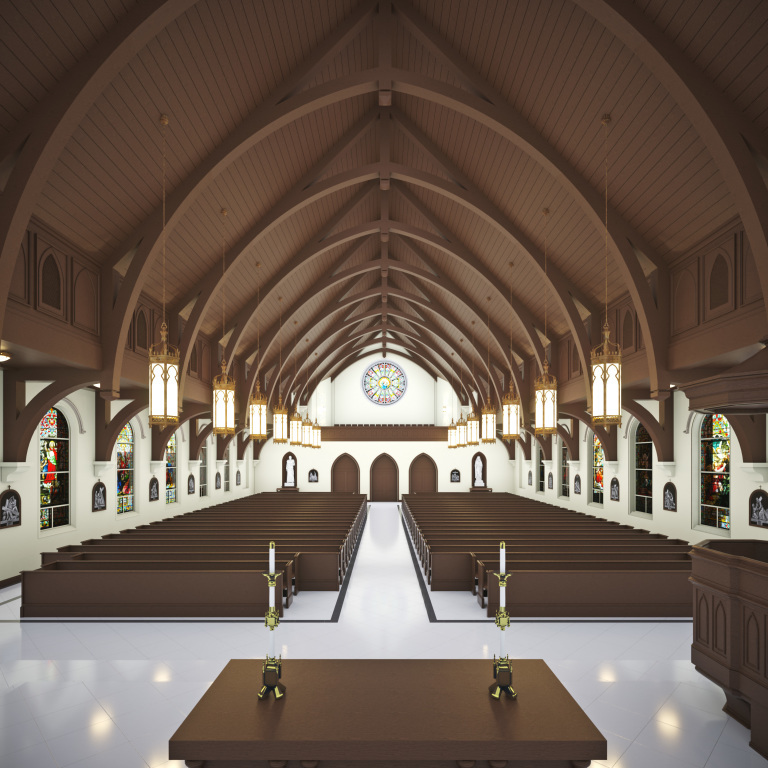 The focal point of the master plan was the construction of a new parish church. The St. Ambrose master plan was approved by the Fairfax County Board of Zoning Appeals in February of 2016. 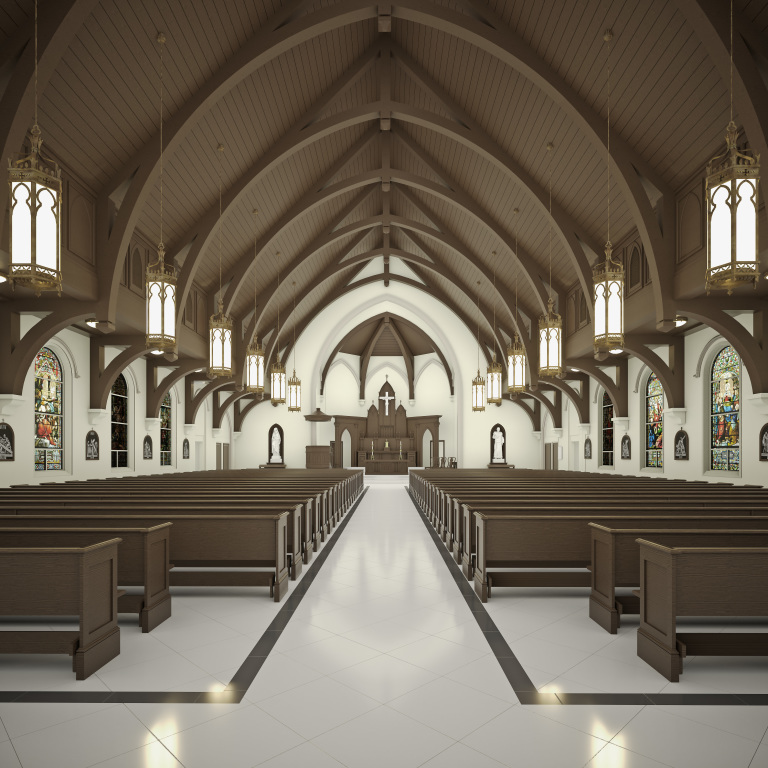 In the summer of 2016 an architecture firm was hired to begin development of the plans for a new church. These plans have been modifed as a result of consultation with parish leadership, the diocese, and the Board of Zoning Appeals. 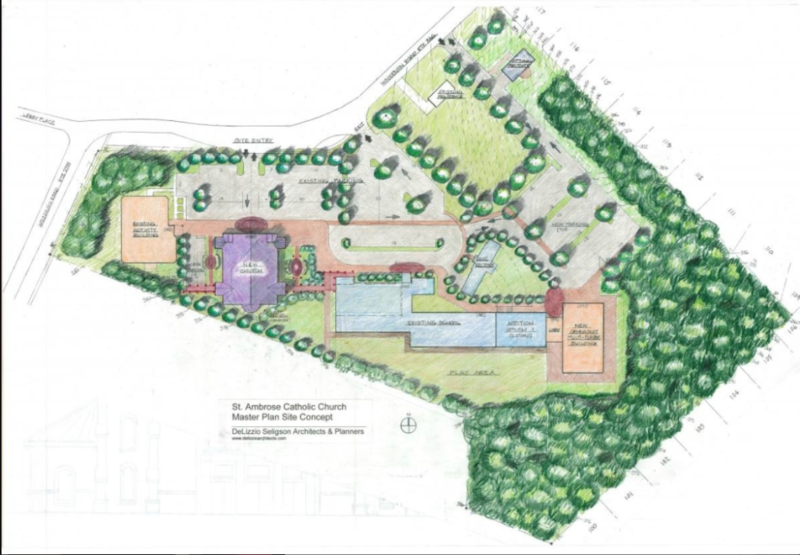 The original Master Plan projected the demolition and contruction of the new church building along with an expansion of the parish parking to correspond with the expansion of seating in the new church building. The original plan called for creating additional parking around the current rectory. In order to accomplish this, some of the trees surrounding the rectory would need to be removed. This plan caused concern among members of one neighborhood association. These objections were voiced during the zoning board meetings, which in turn delayed the process of our master plan project, which now has been approved by the county. Around this same time, a house on Woodburn Road, owned by parishioners and adjoining parish property, became available for purchase at a reasonable price. This provided the parish with a new option for expanding parking while minimizing the impact to the surrounding trees, and thus addressing the concerns raised by our neighbors. The decision was made to purchase the house. The house would be renovated and the space over the garage would be expanded so that the house would have sufficient space to accommodate three resident priests and up to two guests. Once the work on the house is completed, the priests will move out of the current rectory and that building will be demolished to provide the additional parking needed. In the course of beginning the renovations to the new rectory, it was discovered by the contractor that at the time of the original construction of the house, parts of the house were built on loose soil and sand rather than a solid base. The contractor needed to add additional footers and support systems to accommodate the additional weight of the new addition to the house. A structural engineer was brought in for consultation. This has caused the projected completion of the renovations, and the subsequent relocation of the priests, to be delayed. At this time there is no set date for the priests to move from the current rectory to the new one. With that said, there is no fixed start date for demolition of the current rectory and the installation of the additional parking. Finally, the projected start date for the demolition of the current church building and the construction of the new church has not yet been determined. Moving forward on this phase of the master plan is dependent on the completion of the new rectory and the installation of the new parking spaces. It is also subject to the final approval of the Diocese of Arlington. One aspect of this approval is the determination of the total cost of the entire Master Plan project (currently projected to be between $10 Million and $12 Million) and the amount of money the parish will have to borrow from the diocesan DIAL accounts. The policy of the diocese is the parish must demonstrate the capacity to repay any loan amount within a ten (10) year period. Factors that will be part of determining the size of the loan as well as the capacity of a parish to repay such a loan include monies already raised through a capital campaign, the planning of additional campaigns prior to or during the ten year window for loan repayment, and the strength of the parish's annual offertory. St. Ambrose parish has currently collected over $2.5 million toward the additional parking and the new church construction. As stated above, the purchase and renovation of the new rectory was paid for from the parish savings and operating budget. Please feel free to contact Carla Yaglou, St. Ambrose Accountant, at (703) 280-4400 if you have any questions.